The NY Times takes notice of Philadelphia’s Land Bank plan. via Philadelphia Forges Plan to Rebuild From Decay – NYTimes.com. 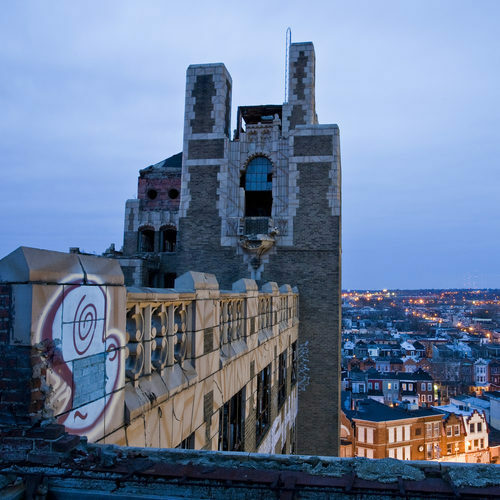 An estimated 40,000 vacant, derelict or underused buildings and lots — both publicly and privately owned — that are candidates for the Philadelphia’s new Land Bank, an ambitious program that is the latest effort to clear up blighted neighborhoods. PHILADELPHIA — On a desolate North Philadelphia street, an isolated block of five Victorian rowhouses is surrounded by vacant lots and a commuter rail line. All but one of the two-story houses are vacant; burn marks outline boarded-up windows and a door on one building, and two display metal signs announcing they are up for property auction by the Philadelphia Housing Authority. The open rear entryway of one reveals a mess of bedding on a sheet of plywood, suggesting the derelict property does in fact have an occupant. The city lists the market value of each empty house at $27,900. The houses, little more than a mile from downtown Philadelphia, are among an estimated 40,000 vacant, derelict or underused buildings and lots — both publicly and privately owned — that are candidates for the city’s new Land Bank, an ambitious program that is the latest effort to clear up blighted neighborhoods. Philadelphia, with a population of about 1.5 million, is the largest American city to adopt a land bank, experts said, and could become a model for other cities like Detroit that have an even bigger problem with vacant property. While land banks have been around for several decades, including one in St. Louis that was set up in the 1970s, several dozen exist now, with newer versions emerging in places like Syracuse and Macon, Ga. Supporters point to success stories elsewhere. For example, in Flint, Mich., Saginaw Street has been transformed into a busy commercial and residential center after the local land bank’s acquisition of three buildings that had been vacant for as long as 30 years, said Frank Alexander, a professor of real estate law at Emory University and an author of land bank laws in many cities. But not all land banks have succeeded. Critics are concerned about a provision in the ordinance creating the Philadelphia Land Bank that requires City Council approval for all sales, saying that could delay the disposal of properties and bog down redevelopment. An early land bank in Cleveland failed, for example, because it required legislators to sign off on all acquisitions and dispositions, Mr. Alexander said. And it takes time to assemble buildings and land that are attractive to developers, said Kelly Clarke, executive director of the Kalamazoo County Land Bank, in Kalamazoo, Mich.
“It’s not always about getting properties sold quickly,” said Ms. Clarke, who said her organization had sold about 50 homes, demolished 40 others and sold about 150 empty lots since it was established in 2009. Rick Sauer, executive director of the Philadelphia Association of Community Development Corporations, which has helped lead the Land Bank initiative, said he believed it would offer developers a much easier process to navigate. Previously, developers sometimes walked away from potential projects if they had to acquire land or buildings from different city agencies with different requirements. Many of these vacant properties can be found on several agencies’ books. The new city ordinance aims to consolidate ownership of the properties under the roof of the Land Bank. And to encourage developers to buy through one-stop shopping, the city ordinance also gives the Land Bank power to acquire title to privately owned vacant properties if they are delinquent in taxes. Officials said about three-quarters of Philadelphia’s vacant properties were privately owned and many were behind on taxes. That has deterred prospective buyers who have trouble tracking down owners of long-abandoned properties or dealing with liens on the buildings. Once the Land Bank is operational later this year, developers will be in a better position to take control of whole blocks that currently show a “gap-tooth” patchwork of public and private buildings and land, proponents say. This primer is presented in its entirety by the Committee of Seventy. we will be paying attention to the workings of the Land bank and reporting progress here. A proposal that has been decades in the making is finally moving forward. Barring some unforeseen roadblock, City Council will give final approval next Thursday to what will be known as the Philadelphia Land Bank. Its purpose is to expedite the process for turning over 40,000 abandoned properties (10,000 of which are publicly-owned) to responsible tax-paying owners. As usual in Philly, the road to the Land Bank has been bumpy. And the final outcome – achieved after more-public-than-usual disagreements in City Council – leaves no one completely happy. This edition of HOW PHILLY WORKS explains what to expect from Philly’s about-to-be new Land Bank. Disagreements in Council? Tell me about it. The disputes in City Council may be the juiciest nugget of the Land Bank story, but you kinda need to know more about what the Land Bank is all about to fully appreciate them. Here’s the headline: it has to do with the extent of City Council’s power. City Council seems to be more vocal these days. Let me guess: Council will have more power. Yes and no. More power than some thought they should have. Less than others wanted. Keep reading. 40,000 vacant properties? That’s astounding. Where are they? The largest concentration is in North and West Philly, but a map created by Philly Landworks (which we’ll explain in a bit) shows vacant properties all over the city. What will a Land Bank accomplish? Why is it called a “Bank”? Because it virtually holds onto land until a buyer comes along to “withdraw” it – just like a bank hangs onto your money until you decide to take it out. Who is in charge of publicly-owned property right now? At the moment, most publicly-owned properties have three different masters: the city’s Department of Public Property, the Philadelphia Redevelopment Authority, a state-authorized agency that currently implements the city’s vacant land policy; and the Philadelphia Housing Development Corporation, a non-profit 501 (c)(3) organization that provides housing programs for low- and moderate-income city residents. Potential buyers not only have difficulty finding information about who owns properties and how much they might cost, but also have to endure an approval process that typically requires many different steps that can take years, depending on the agency involved. Didn’t Mayor Nutter try to solve this problem before? The mayor launched the Philly Landworks database, which lists information about publicly-owned properties in one place. But that hasn’t necessarily made the purchasing process any easier. Many properties are listed without prices or references to the Council district in which they are located (this is important for reasons we’ll get to). Potential buyers can “express interest” in properties, but then must wait for the agency who owns the property to respond. Will the new Land Bank let me buy the property it owns as easily as I would a private property? No, though the Land Bank will (ideally) make purchasing property easier than the current process. I thought the whole point of the Land Bank was greater speed and efficiency. Those are goals, but remember this is government we’re talking about. The wheels always move more slowly than in the private sector. Potential buyers of properties held by the Land Bank will need approval from City Council (or, more narrowly, the district Council member where the property is located), the Land Bank’s Board of Directors and something called a Vacant Property Review Committee (VPRC). That’s a lot of steps. What is the Land Bank’s Board? After interim appointees, there will be 11 members on the Board: five appointed by the mayor, five appointed by a majority of City Council members and one appointed by these first 10 members. All must have some expertise in areas related to the Land Bank’s business, e.g., planning, real estate development, open space or architecture. And at least four members (two of the mayor’s and Council’s appointees) must represent non-profit or advocacy organizations working in the field of housing or community development or civic associations in low- or moderate-income areas. Can I get on that Board? It depends on whether you meet the qualifications we just talked about. You also can’t be an elected public official. And you must live or have a primary office in Philadelphia. And the Vacant Property Review Committee? Unlike the Land Bank Board, the VPRC is not new. It’s comprised of several city department heads, representatives of organizations that deal with issues related to housing and development, the Chair of Council’s Committee on Public Property and Public Works (now the Sixth District’s Bobby Henon) and the Council President (or their designees). VPRC’s president is chosen by the Council President. You can see the proposed makeup of the VPRC here. What does the VPRC do? According to the Philadelphia Code, it’s an advisory committee that determines whether or not to recommend or certify the sale of vacant properties. The new Land Bank bill adds some new provisions: the VPRC must give 10 days notice of a public hearing on proposed transfers of properties owned by the Land Bank by posting notices on City Council’s and the Land Bank’s websites. The websites must also list all regularly scheduled meetings and the transcripts of completed hearings. Get back to the Council disagreement. What was that about? Seventh District Councilwoman Maria Quiñones-Sánchez, who along with At-Large Councilman Bill Green introduced the Land Bank bill back in February 2012, favored getting rid of requiring review by the VPRC and the approval of the District Council member on whose turf the property sits. (This approval power, known as “councilmanic prerogative,” is an unwritten practice that allows each of Council’s 10 district members to have final say whether projects in his or her district go forward, are stalled, or rejected altogether. You can read more about “councilmanic prerogative” in two earlier How Philly Works installments here and here). Probably the last person she wanted on the other side: Council President Darrell Clarke, who represents the Fifth District. He thought the Quiñones-Sánchez plan would give far too much power to the Land Bank’s Board. He supported requiring VPRC review and “councilmanic prerogative” before properties were sold. Clarke also wanted Council to have the authority to determine which properties would be acquired by the Land Bank. I understand the “councilmanic prerogative” part. But why is the VPRC review so important to Clarke? Clarke claims the property disposition process requires more oversight to make sure it is fair and effective. And remember that the Council President appoints the VPRC’s chair. Neither. The Land Bank bill keeps intact the role of the VPRC (although with more transparencies about its proceedings we just mentioned) and “councilmanic prerogative.” But Clarke didn’t prevail on giving Council the “first” word on which properties are acquired. Come on. Someone had to win. On balance: Clarke. Getting the last word has more impact than getting the first word. How can the city afford another agency? Creating an entirely new agency is not likely to happen given the limits of the city’s budget. As it stands now, the Philadelphia Housing and Development Corporation (PHDC) is the proposed home of the land bank. I’ll be more direct: How much will this cost taxpayers? According to testimony presented in October at Council’s Public Property and Public Works Committee, there will be a one-time $1.5 million cost to move properties from the three agencies that now own publicly-owned properties into the Land Bank and to build systems within PHDC to track them. Employees who work on the acquisition and sale of publicly-owned properties will be transferred to the new Land Bank. Subject to details still to be worked out with the employees’ union, there should be no change in salaries or retirement benefits. The annual operations costs are anticipated to be in the $4 million range (which is what the three agencies collectively spend now). So where will the $4 million come from? If all goes according to plan, revenue from the sale of properties will offset the cost of running the Land Bank. But it may take some time for proceeds to catch up, because many of the vacant properties are not particularly desired by the private market. Do other cities have Land Banks? Land Banks have been adopted by more than 75 local governments, including Cleveland, Louisville, Atlanta, and Genesee County, Michigan, but Philly would be the largest city to form one. The Land Bank run by Genesee County (home of the city of Flint) automatically starts to foreclose on properties that are 25 months delinquent in unpaid taxes. Since its creation in 2004, the Land Bank has sold about 3,000 properties and demolished 1,300 rundown houses. It now holds over 10,000 properties. Land Banks work better in some cities than others. The devil is in the details. How will we know if the Land Bank is working? One year after it is created, and then annually, the Land Bank’s Board is required to develop a Strategic Plan to guide the acquisition, maintenance and disposition of property. Public hearings will be held in City Council prior to Council’s required approval of annual strategic plans. The Board is also obligated to produce and post online annual performance reports with information about the properties bought and sold and the Land Bank’s progress in meeting annual goals. What does Seventy think about the Land Bank? Seventy strongly supports the creation of a Land Bank. But we have been outspoken about our concerns about the unfettered exercise of “councilmanic prerogative.” We testified about those concerns in relation to the Land Bank proposal before a City Council Committee in October, which you can read here. Next Thursday is Council’s last scheduled session day before their holiday break. We expect the Land Bank proposal to pass. Then it moves to Mayor Nutter for his approval. Our best guess is that the mayor will sign on. He already named five interim Land Bank Board appointees. Then it’s smooth sailing for the Land Bank? Again, remember that this is government. City Council has to put current publicly-owned properties into the Land Bank through an ordinance (which means some properties could be held back). And the interim Land Bank Board members have many, many key decisions to make. This will be a continuing story.